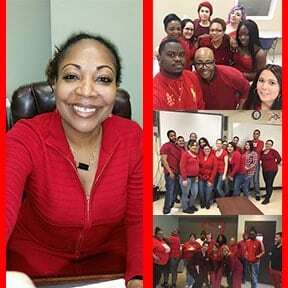 February 5, 2016, All Locations – American Institute joined the Go Red for Women event again in 2016, with students, staff, and faculty all sharing their support and wearing red in support of the American Heart Association‘s efforts to increase awareness of the impact of heart disease in women. According to the AHA, heart disease is the No. 1 killer of women, causing 1 in 3 deaths each year, but it doesn’t affect all women alike, and the warning signs for women aren’t the same in men. By wearing red and discussing the signs and symptoms of heart disease in women, the Go Red For Women campaign helps educate women and their healthcare professionals on ways they can fight this disease. As a provider of healthcare career education, American Institute is proud to support this effort each year in each of our campuses and help educate future medical professionals and potentially save lives.